Note: This work is stretched. Gabriella Possum Nungurrayi is the daughter of Clifford Possum, one of Aboriginal art's most important artists. Her career has in itself been impressive; her art was projected onto the Sydney Opera House in 2016, two years after it appeared on a Melbourne art tram, and she has also painted in the foyer of the United Nations. 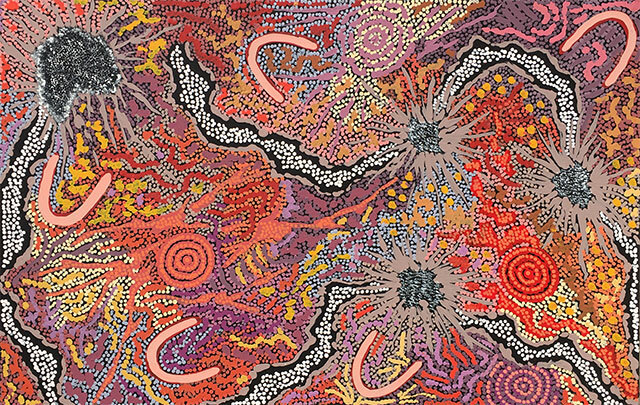 Milky Way (Seven Sisters) and Grandmother's Country are both synonymous with Gabriella Possum. In fact, in 2008 a 20-metre installation of her Grandmother's Country was incorporated into Jamie Durie’s gold-prize-winning Chelsea Flower Show exhibit in the UK. That painting, presented to Queen Elizabeth, now hangs in the royal collection, alongside a work by her famous father. We are lucky to have Gabriella working at an associated studio at present to produce this painting. And she has been provided with the best Belgium linen and (Matisse) acrylic paints to work with and the quality of the work is superb. 05.07.10 | Diana Lowenstein Fine Arts brought a piece of Australia to Miami with "The Inspired Dream"